Isolation and characterization of mesenchymal cells from BAL of lung transplants. (A) Mononuclear cells obtained from BAL of lung allografts were plated and maintained in culture. Giemsa staining at day 10 identified the CFU-Fs (left). The top right panel shows an individual CFU-F (original magnification, ×10). On subsequent trypsinization and culturing, a homogeneous population of mesenchymal cells was obtained by passage 2 (bottom right). (B) Immunofluorescence staining of mesenchymal cells at passage 3 demonstrated expression of vimentin (an intermediate filament protein), prolyl-4-hydroxylase (a collagen cross-linking enzyme), and Ki67 (a marker of proliferation). 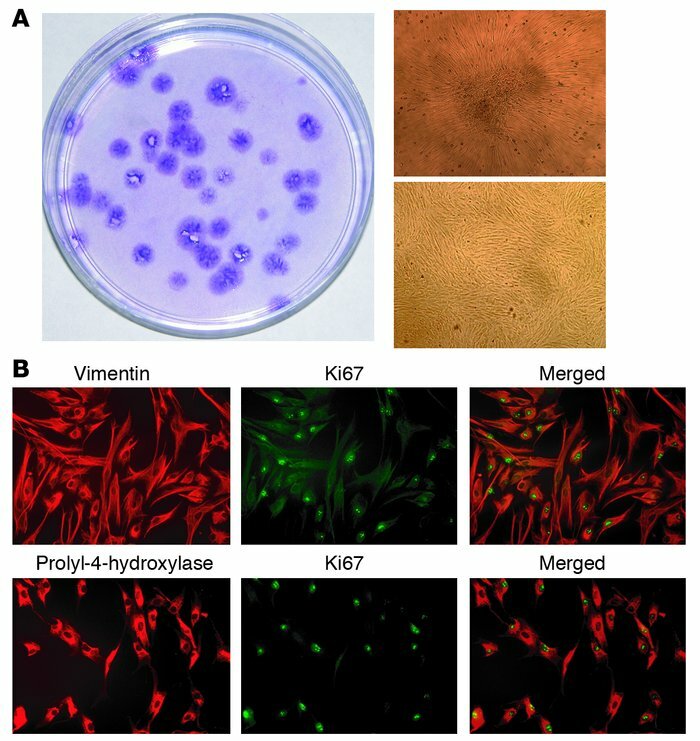 Merged images (right) demonstrated that the majority of vimentin- and prolyl-4-hydroxylase–expressing mesenchymal cells were actively proliferating.